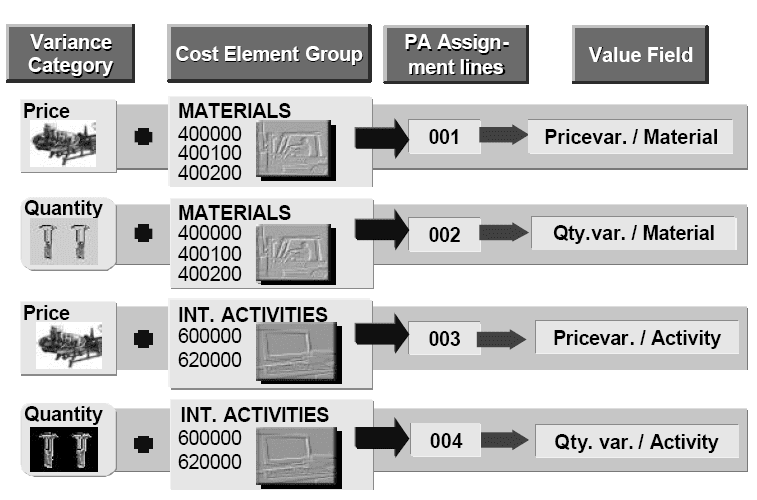 Value Flow from Cost Object Controlling in SAP deals with cost objects of erp sap.When the cost object is created in sap for abap programming and controlling , a preliminary cost estimate will be carried out automatically to calculate the planned costs for the cost object.Actual costs are incurred when materials from stock or activity types of cost centers are consumed. Primary costs can be posted directly from other system components to the production order. 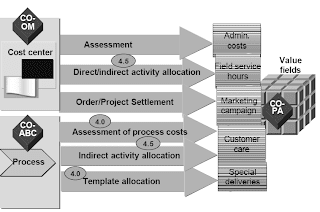 Process costs can be incurred by allocating process quantities using the process template. Since the related costs are posted to the production order simultaneously with the consumption of materials and activity, production order costs can be reviewed and analyzed at any time. When the produced goods are delivered to stock, the cost object is credited with the value of the delivered quantity and the goods are capitalized in inventory. Depending on the method of price control, this may result in revaluation of the finished goods inventory. In this example we use a standard price controlled material.After finishing the production process, or at the end of the period, the production order will be settled to a price difference account. In account-based Profitability Analysis, how variances are updated depends on how the price difference account is defined. This account must be defined as a cost element in CO for variances to be assigned to a profitability segment (general posting assignment logic). The account for the price difference posting is found automatically in MM.In costing-based CO-PA, you can assign these variances to different value fields according to variance categories and cost elements. To transfer variances, the Variances flag must be selected in the settlement profile assigned to the relevant production order. Again, the costs are assigned to value fields in a PA transfer structure. There you can assign variance categories and cost elements to the desired value fields.The system finds the profitability segment automatically in order settlement based on the information found in the production order and using characteristic derivation. n Note: Only variances calculated in target version 0 can be settled to a profitability segment. To show in Profitability Analysis all the costs incurred in Overhead Costs Controlling, you can transfer to CO-PA those particular overhead costs for cost centers and business processes that are not allocated to the inventory. This can be done using periodic assessment.You can also perform direct or indirect (new in Release 4.5) allocation of internal activities for cost center and business processes in CO-PA. 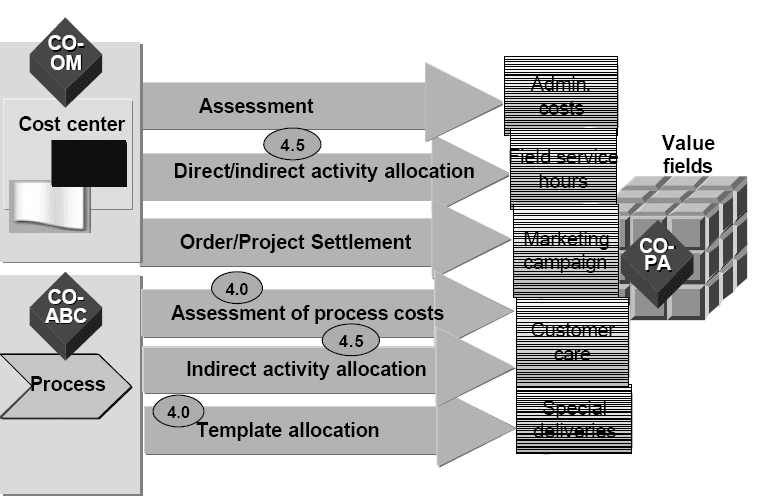 Along wíth the sender (cost center or process) and the receiver (profitability segment), you enter the quantity of the activity performed and valuated it with the planned price of the activity type. The amount that is arrived at is credited to the sender and debited to the profitability segment receiving the quantity. This means, for example, that a transport activity can be directly posted to particular customers without first having to be posted to a cost center or an order. 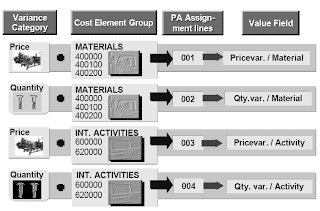 The Activity-Based Costing (CO-OM-ABC) application component provides an alternative form of overhead control that is particularly useful when indirect activities generate a large share of the value added to products. 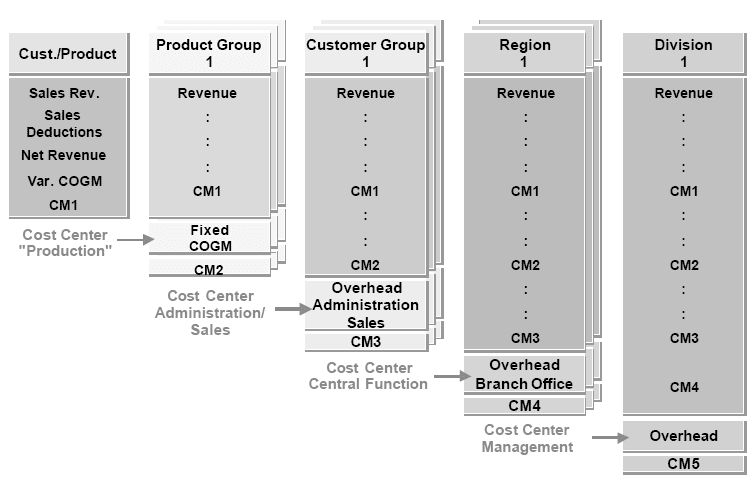 It uses “cost drivers” to allocate internal activities to “overhead processes”, which can then be assessed to profitability segments. 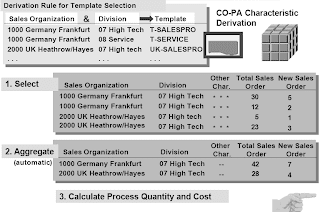 Reference values for the transfer can be quantities and values posted in CO-PA or additional cost driver information, such as the number of sales orders processed (see also the LIS interface in the unit “Planning”).This function makes it possible for you to transfer the variances in production cost centers as well as the costs in sales and administrative cost centers to Profitability Analysis. contain the control information for the assessment and can be maintained in Customizing. First, using characteristics specified in the template determination rule, the system finds all data with that set of characteristic values. Second, the data is aggregated (summarized) for each set of characteristic values. Forth, CO-PA is updated with the results of the calculation. 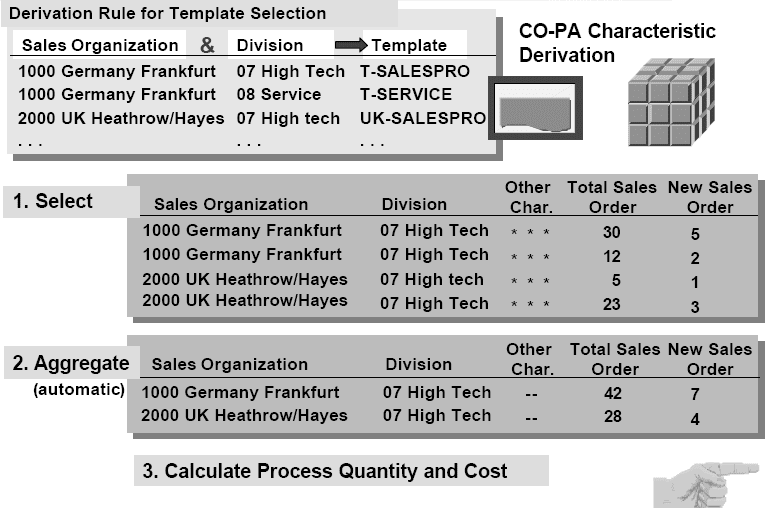 You may assign your processes to profitability segments on a more detailed level than specified in the characteristics from the derivation rule.To do this, you specify additional update characteristics in CO-PA configuration. You can add an unlimited number of additional dimensions of CO-PA as relevant characteristics for posting your processes. Depending on the characteristics of the derivation rule plus the additional characteristics relevant for posting, the R/3 system can dynamically derive up to 5 additional characteristics for the posting of processes. All single items of your operating concern complying with the characteristics that you select as relevant for posting are aggregated and the processes will be posted to this aggregate data set (profitability segment). SAP Controlling deals with settlement of orders in a systematic way.n In the R/3 System, you can settle internal orders (CO), sales orders (SD), projects (PS) as well as production orders and run schedules with production cost collectors (PP) to profitability segments.These objects are used for various purposes which are relevant to Profitability Analysis. Internal orders and projects can be used to control the costs of an internal activity, such as the costs of an advertising campaign. The costs of the activity are posted to the order and collected there. At the end of the activity, they are settled to the appropriate profitability segments, such as the product range and sales area. You can also use CO orders to calculate anticipated values in order to be able to evaluate the accuracy of your accrual method. First, you credit the accrual costs calculated in CO-PA to a special cost order for accruals (currently by manual posting only). When the costs are actually incurred, they are posted to that order as well so that the difference between the anticipated costs and the actual costs can be displayed at order level. A third possible use of internal orders or projects is in make-to-order manufacturing. If you are dealing with a sales orders from SD, a customer project or a CO order to which revenue postings are allowed, you can post costs (production costs, S&A costs, and so on) as well as revenue and sales deductions to the order or project. 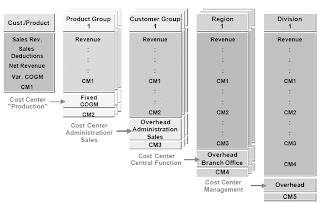 Then when the product is complete, the costs and revenues can be settled to Profitability Analysis. It is also possible to transfer accrued values which are particularly important for progress billing.